In spite of the demonstrations in the streets of Caracas, Hugo Chávez is quite likely to squeak through with a win in this weekend's referendum  legitimately. Nonetheless, critics say he may be morphing into a "democratator"  a democratically elected dictator. Elections and plebiscites are a sort of a moral Teflon for Chávez against charges from enemies like the U.S. that he's another Latin despot. (And he has developed some expertise at them: he has been elected three times and beat back a recall referendum in 2004.) But despite Chávez's claims that he's forging "a more genuine democracy" that finally enfranchises the nation's majority poor, Venezuela hardly looks poised to become a showcase for the separation of powers. The National Assembly and Supreme Court are Chávez's virtual rubber stamps; and, while free speech admittedly is still intact in Venezuela, he has increasingly defined opposition to his ideological agenda as counter-revolutionary treason. 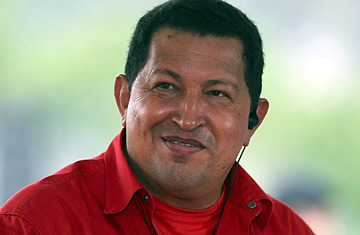 When Chávez pal and former Defense Minister General Raúl Baduel  who helped put Chávez back in power after a failed coup attempt in 2002  complained this month that the amendment package being voted on Dec. 2, including a proposal to eliminate presidential term limits, constituted a constitutional "coup d'etat," he was immediately branded a traitor. A decade after most of Latin America returned to democratic elections, it was thought by now the region would also be governed more completely by democratic institutions. Instead, says Robert White, head of the Center for International Policy in Washington, D.C., and a former U.S. ambassador in Latin America, "Personalismo is alive and well," referring to the region's historical penchant for protracted personal rule. A chief reason, White notes, is that traditional democracy and capitalism have largely failed to improve Latin America's gaping inequality and frightening insecurity  so voters have largely decided to "cling as long as possible" to leaders like Chavez and Uribe who they feel can. "The failure of democratic institutions like judiciaries has led us back to personalismo, this time lightly fettered by constitutional structures," says White. The U.S. has been complicit, he adds, by regularly and rather lazily sending signals to Latin America that free elections alone are enough to build democracies. Chávez backers of course reject the democratator label. "Yes, the intent of socialism is that the collective interest predominate over individual interests," says Haiman El Troudi, director of the Miranda Center in Caracas, a policy research think tank set up by the government. "But if our agenda were Stalinist we would have imposed it by now. Instead we're subjecting these reforms to an election  totalitarian states don't do that." Bernardo Alvarez, Venezuela's ambassador to the U.S., concurs: "We're trying to create institutionality in Latin America precisely because its present institutions don't function." As for unlimited presidential re-election, Alvarez notes that Chávez will still be subject to elections to remain in power  and he adds wryly that the U.S., "where the Bush and Clintons families have been alternating power since 1989," is in no position to lecture.